(1915- ) I'm afraid that I don't know much about Jane Werner Watson, but a great-niece wrote in that she is in her eighties and living in California. Werner wrote and edited many children's books from 1944-1978 (mostly in the '50s) and has published under at least three different variations of her name: Elsa Jane Werner, Jane Werner, and Jane Werner Watson. Many of these were for Golden Books, including at least 35 Little Golden Books, and many for Walt Disney Productions. Some are religious in theme, some silly or comic, and some truly magical. Perhaps even more famous than Jane Werner around here is Garth Williams, who illustrated two of the most famous and sought-after Werner titles. 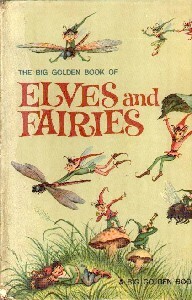 After decades of (expensive) out-of-print status, The Golden Treasury of Elves and Fairies was reprinted in 1999, and quickly went out-of-print again. But wait! Random House, which purchased the defunct Golden Press, has brought it back again! After a two-year wait, it's finally here, as of 9/9/2008, and available for the bargain price of $16.99. 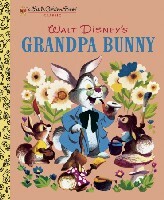 Also back in print is Walt Disney's Grandpa Bunny, and it's as cheap as LGBs always were. The Tall Book of Make-Believe, alas, remains on the out-of-print list. For complete contents of both The Tall Book of Make-Believe and The Golden Treasury of Elves and Fairies, see the Anthologies Finder. Big Golden Book of Poetry. Edited by Jane Werner. Illustrated by Gertrude Elliott. Golden Press, 1949. A Catholic Child's Bible: The Old Testament. (with Charles Hartman.) A Giant Golden Book, illustrated by Feodor Rojankovsky. Simon & Schuster, 1958. A Catholic Child's Bible: The New Testament. (with Charles Hartman.) Simon & Schuster 1958. Chatterly Squirrel. Illustrated by J.P. MIller. Simon & Schuster, 1950. A Child's Book of Bible Stories: From the Garden of Eden to the Promised Land. Illustrated by Masha. Random House, 1944. Christopher Bunny. Illustrated by Richard Scarry, Simon & Schuster, 1949. 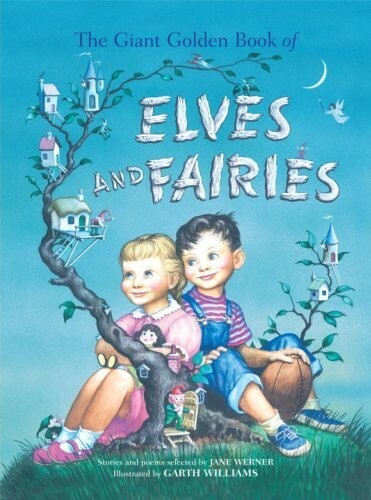 *The Giant Golden Book of Elves and Fairies with assorted Pixies, Mermaids, Brownies, Witches, and Leprechauns. Illustrated by Garth Williams. A Giant Little Golden Book About Plants and Animals. Little Golden Book #5017. Illustrated by Ted Chaiko. Simon And Schuster, 1958. A Giant Little Golden Book of Birds. Little Golden Book Simon And Schuster, 1958. The Tall Book of Make-Believe. Illustrated by Garth Williams. Harper & Brothers, 1950. 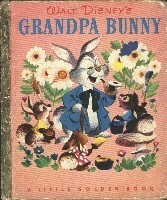 Walt Disney's Bunny Book. Illustrated by Walt Disney Studio. Golden Press, 1951, 1972. ABC is for Christmas. 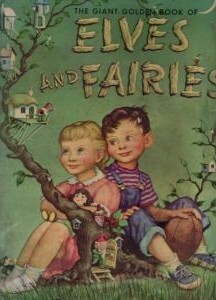 Illustrated by Sally Augustiny. LGB #108*, 1974. Albert's Zoo. Illustrated by Richard Scarry. LGB #112, 1951. Alice in Wonderland Meets the White Rabbit. Illustrated by Al Dempster. LGB #D19, 1951. Animal Dictionary. Illustrated by Feodor Rojankovsky. LGB #379 and #533, 1960. Animal Friends. Illustrated by Garth Williams. LGB #167 and #560, 1953. Bible Stories of Boys and Girls. Illustrated by Rachel Taft Dixon and Marjorie Hartwell. LGB #174, 1953. Birds. Illustrated by Eloise Wilkins. LGB #184, 1973. The Christmas Manger. Illustrated by Settie Lerch. LGB #176, 1953. *The Christmas Story. Illustrated by Eloise Wilkin. LGB #158, 1952. Cinderella's Friends. Illustrated by Al Dempster. LGB #D58 adn #D115, 1950. Dinosaurs. Illustrated by William De J. Rutherford. LGB #355, 1959. First Book of Bible Stories. Illustrated by Eloise Wilkin. LGB #198, 1954. *The Fuzzy Duckling. Illustrated by Alice and Martin Provensen. LGB #78 and #557, 1949. *Grandpa Bunny. Illustrated by Walt Disney Studios. LGB #D21, 1951. The Happy Little Whale. Illustrated by Tibor Gergely. LGB #393, 1960. Heroes of the Bible. Illustrated by Rachel Taft Dixon. LGB #236, 1955. Houses. Illustrated by Tibor Gergely. LGB #229, 1955. How to Tell Time. Illustrated by Eleanor Dart. LGB #285, 1957. Little Golden Book of Hymns. Illustrated by Corinne Malvern. LGB #392, 1947. Republished with illustrations by Frances Score Mitchell, LGB #211-57, 1985. The Mad Hatter's Tea Party. Illustrated by Richmond I. Kelsey and Don Griffith. LGB #D23, 1952. The Marvelous Merry-Go-Round. Illustrated by J.P. Miller. LGB #87, 1949. Mickey Mouse's Picnic. Illustrated by Walt Disney's Studios. LGB #D15, 1950. Mickey Mouse and His Space Ship. Illustrated by Milton Banta and John Ushler. LGB #D29, 1952. Mr. Noah and His Family. Illustrated by Alice and Martin Provensen. LGB #49, 1948. *My Little Golden Book About God. Illustrated by Eloise Wilkin. LGB #268, 1956. The Night Before Christmas. Illustrated by Eloise Wilkin. LGB #241, 1955. Pets for Peter. Illustrated by Aurelius Battaglia. LGB #82, 1950. (from Grimm) The Twelve Dancing Princesses. Illustrated by Sheilah Becket. LGB #194, 1954. Whales. Illustrated by Rod Ruth. LGB #171*, 1978. Where Jesus Lived. Illustrated by Ronald Le Hew. LGB #147*, 1977. Wonders of Nature. Illustrated by Eloise Wilkin. LGB #293, 1957. Uncle Mistletoe. Illustrated by Corinne Malvern. LGB #175, 1953. The Very Best Home for Me! (formerly Animal Friends) Illustrated by Garth Williams. LGB #204-25, 1953.